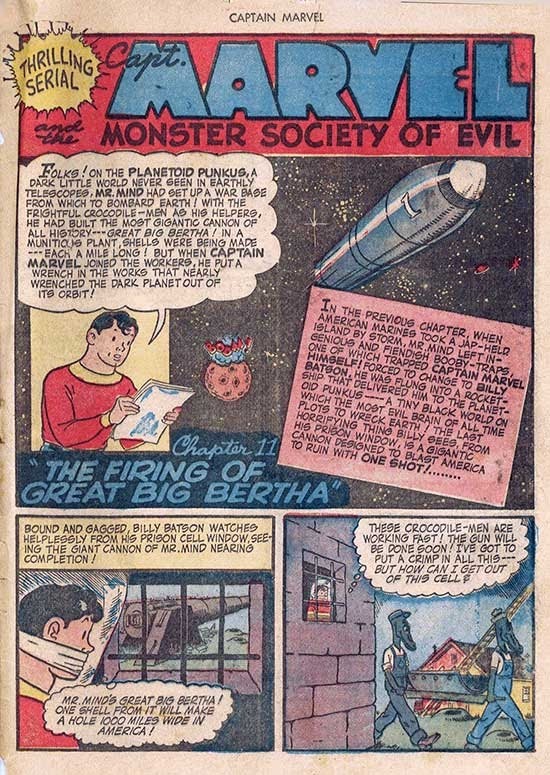 MONSTER SOCIETY OF EVIL "Chapter XI: the Firing of Great Big Bertha"
"I've got to stop that second one somehow!" 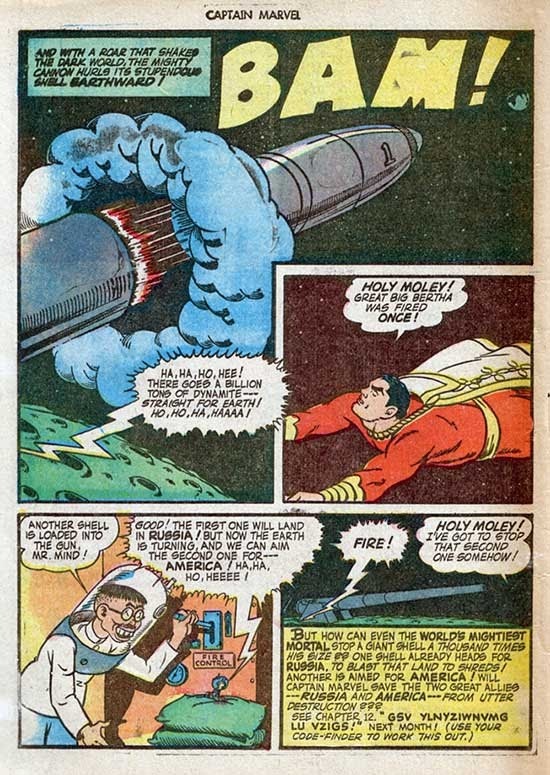 What about the first, Russia-bound, one? 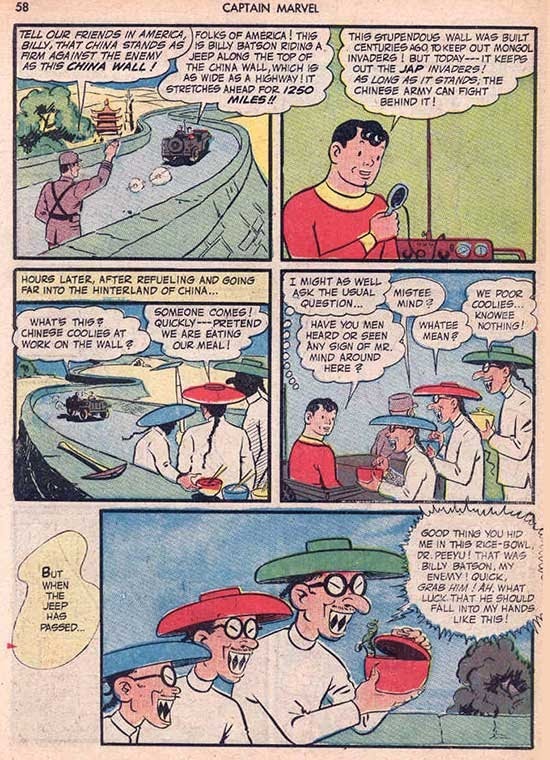 You'll note Dr Smashi's teeth, which were originally fang-like are now the usual sterotypical "Japanese" buck teeth. 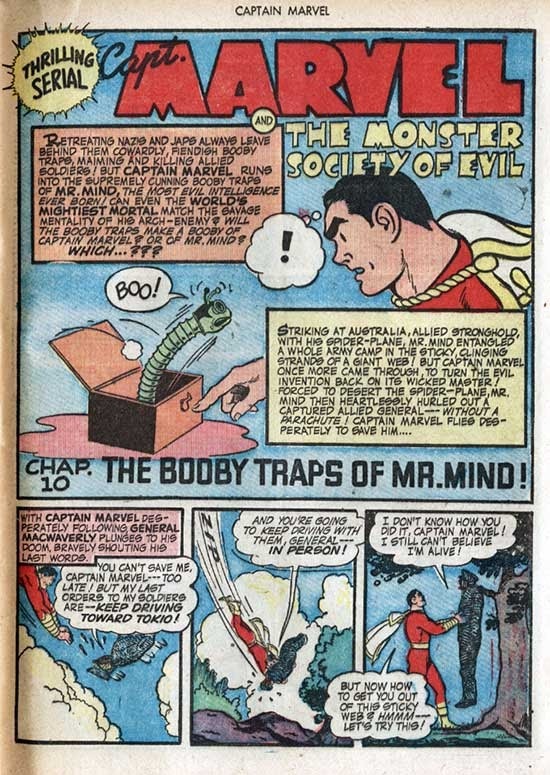 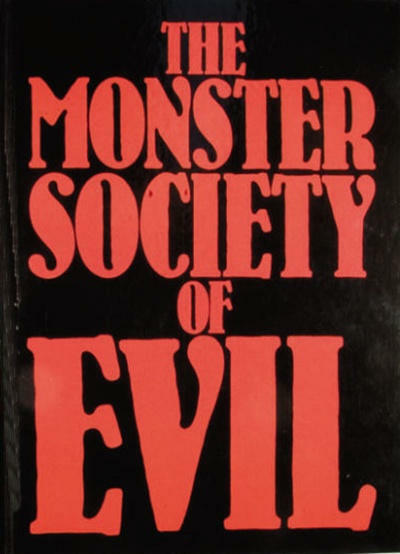 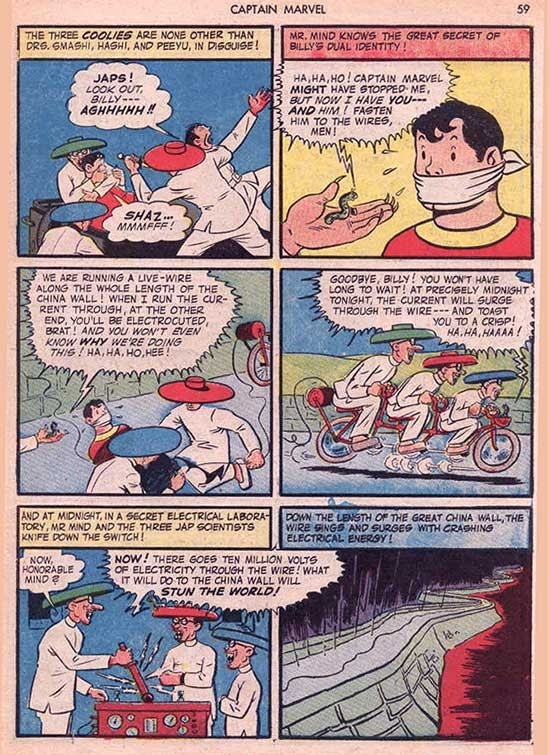 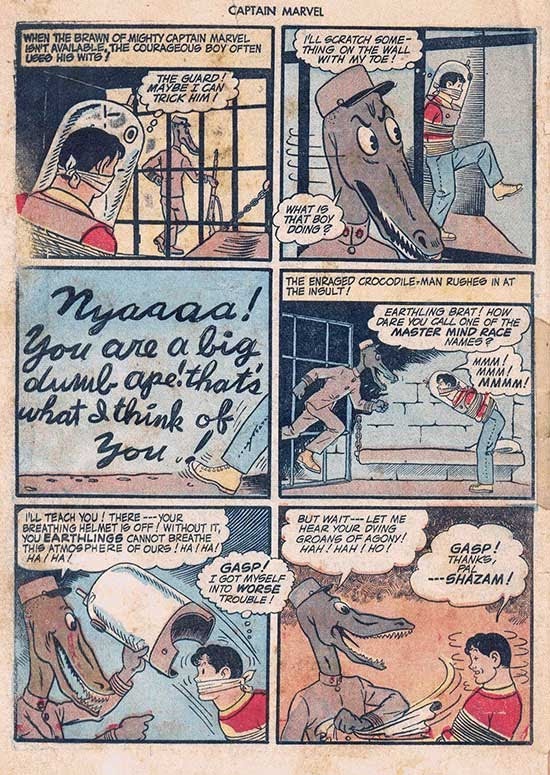 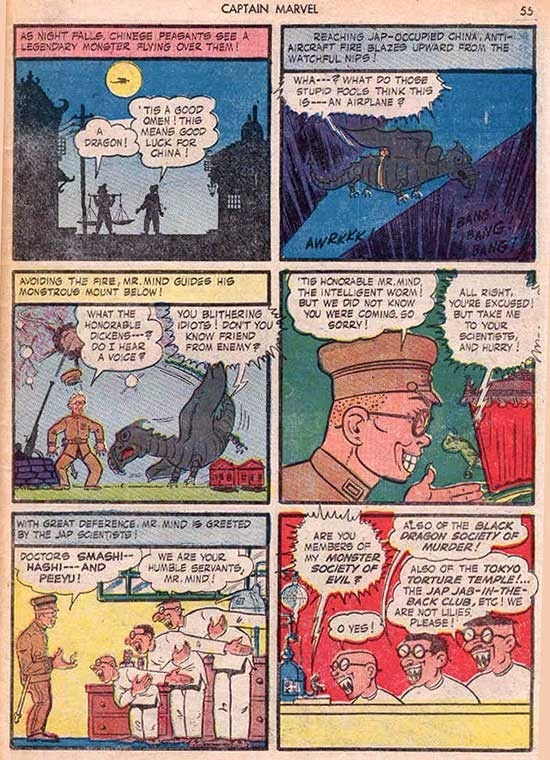 MONSTER SOCIETY OF EVIL "Chapter X: the Booby Traps of Mr Mind!" 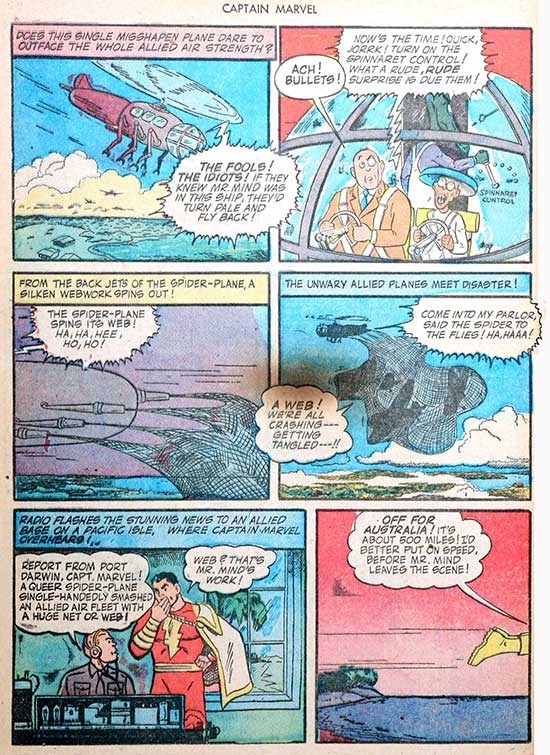 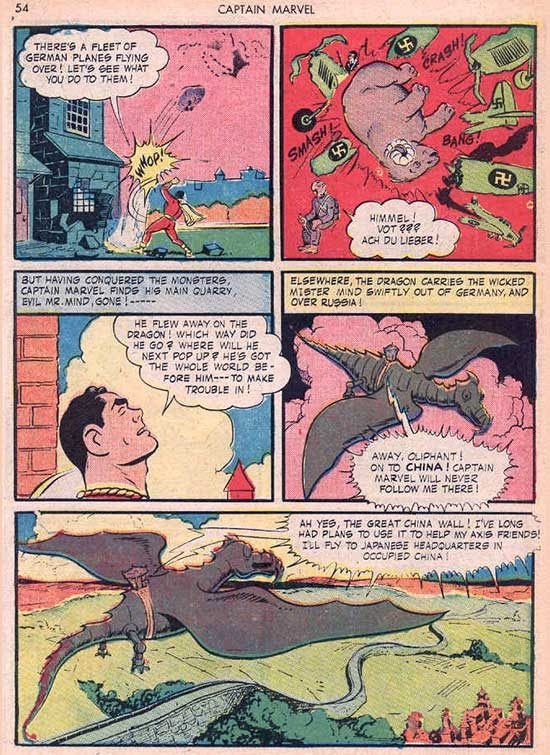 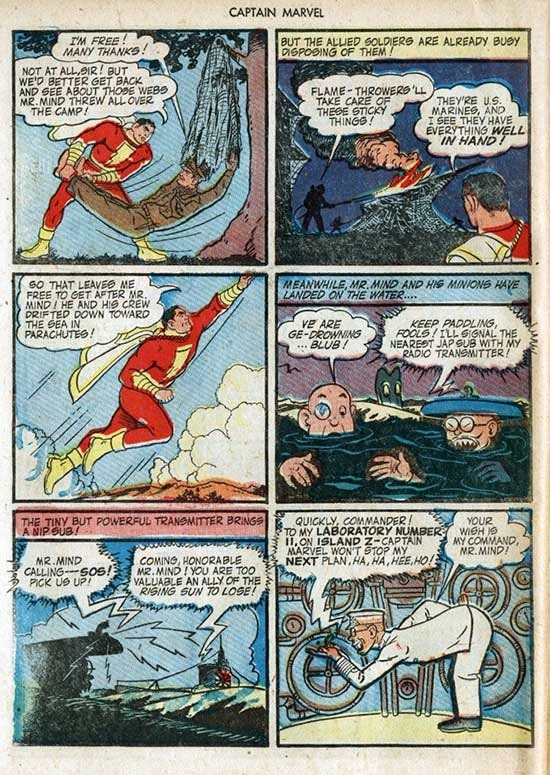 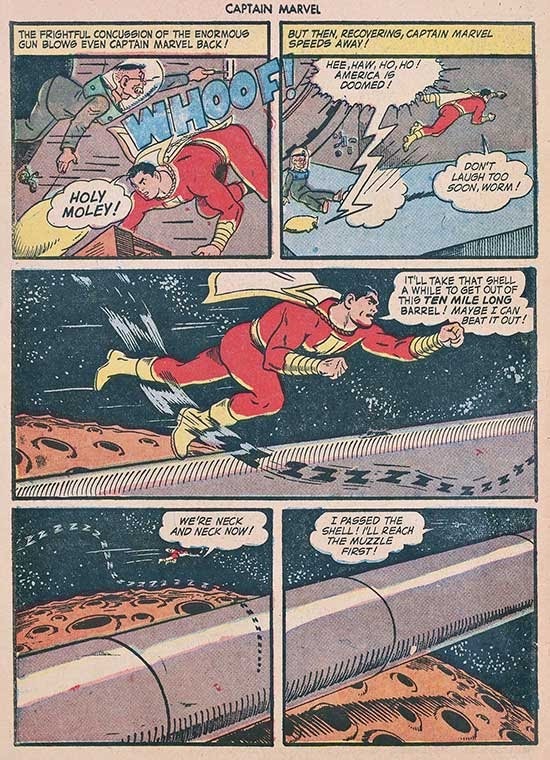 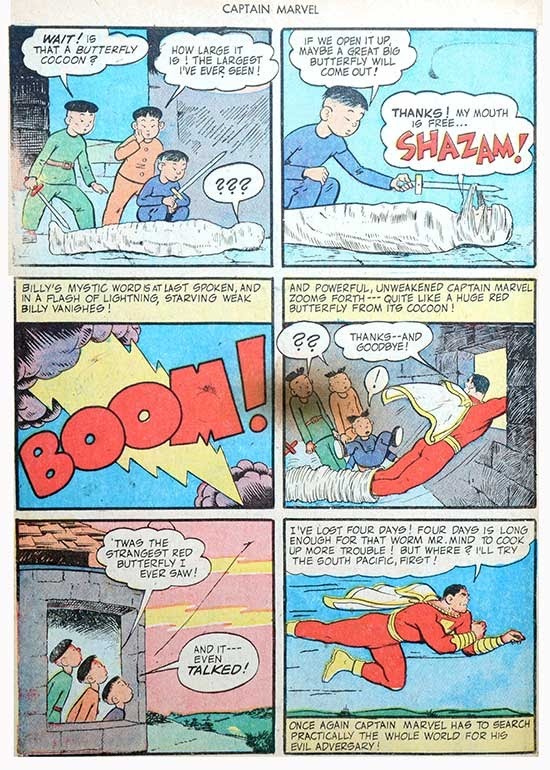 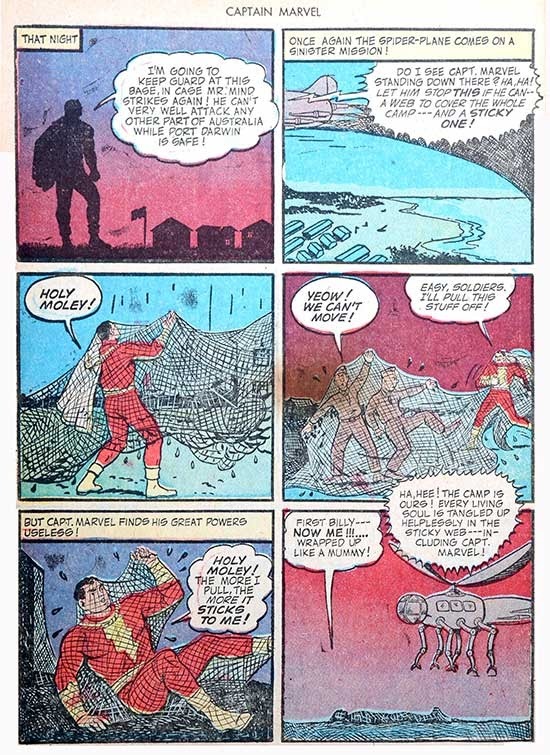 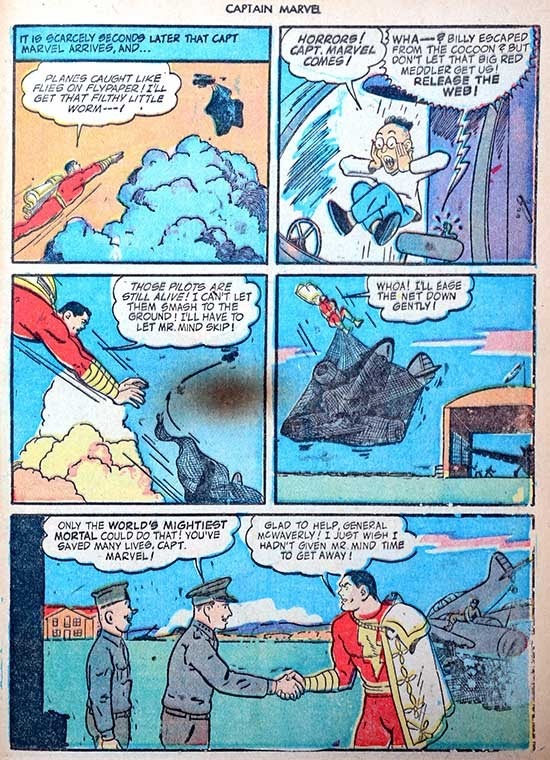 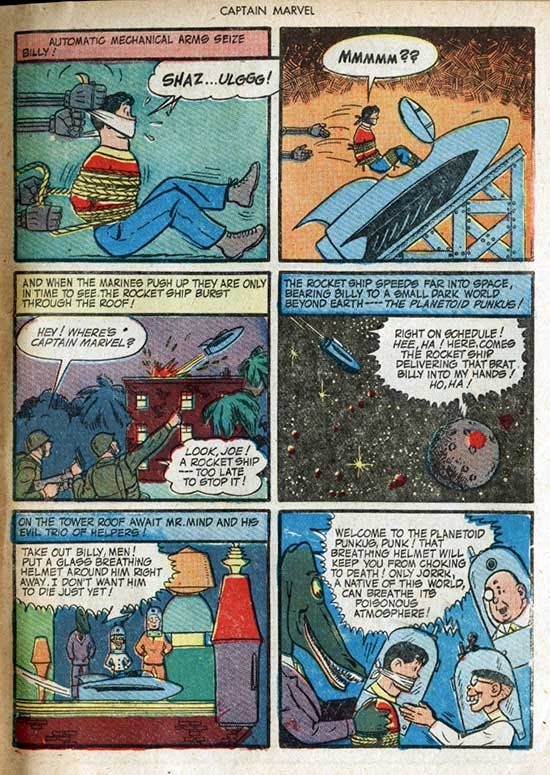 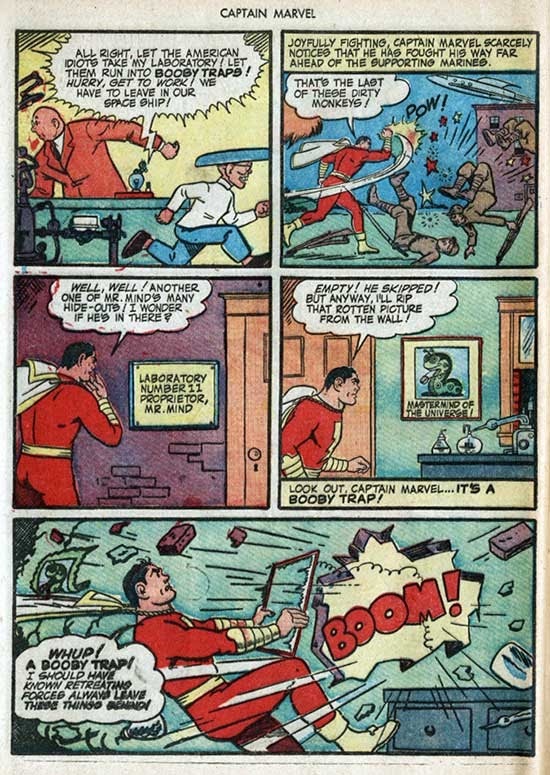 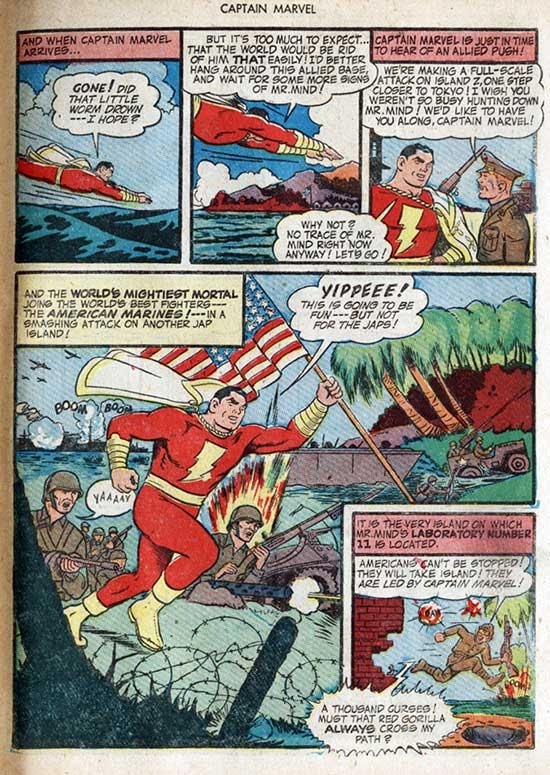 ...one of the highlights of this chapter is seeing how well the Marines operate without Captain Marvel's aid! 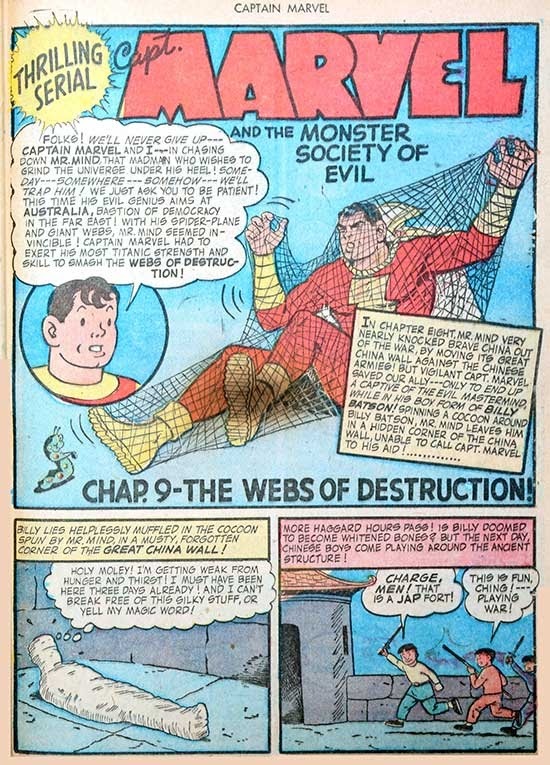 MONSTER SOCIETY OF EVIL "Chapter IX: the Webs of Destruction!" 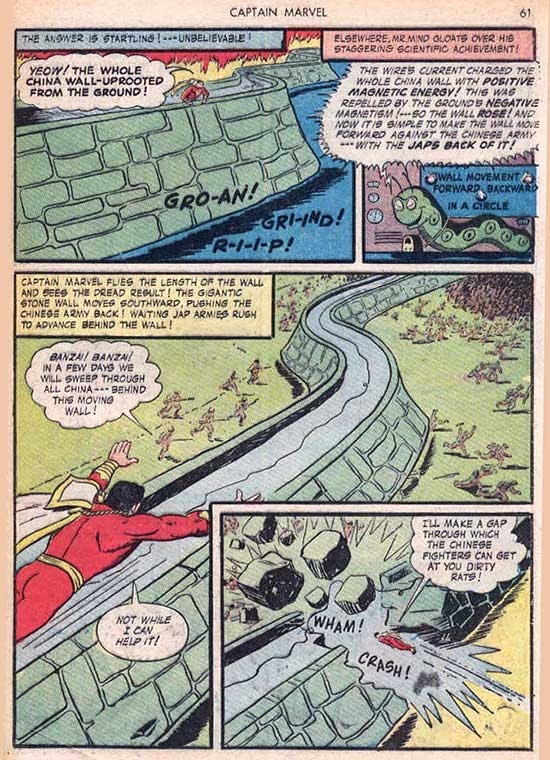 ...obvious question: Considering the whole Great Wall had just been moving, why were kids climbing up on it? 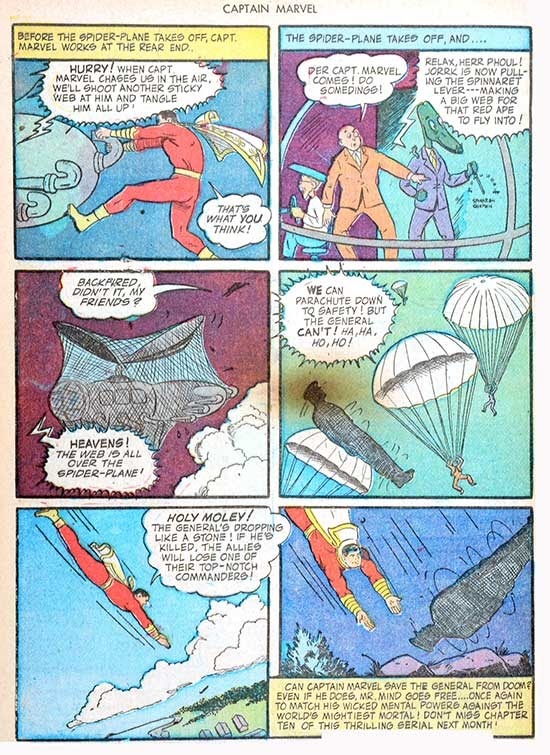 Mr Mind doesn't know his arachnids or aircraft! 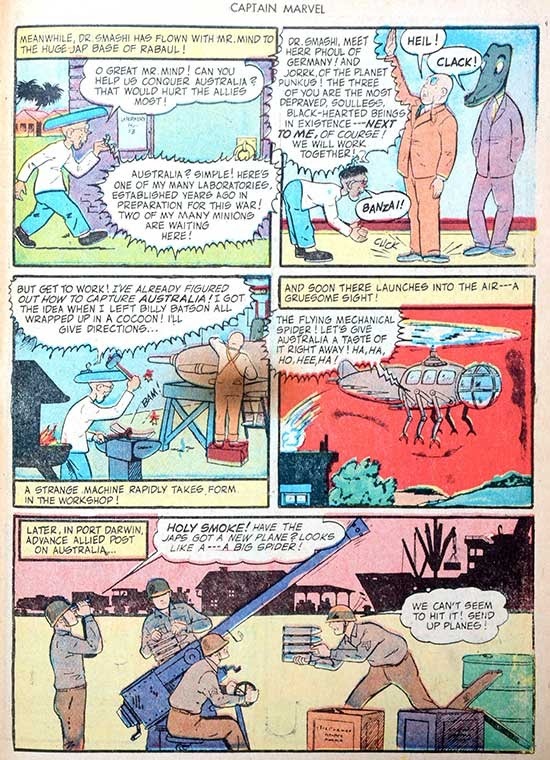 His "Flying Mechanical Spider" has six legs...like a fly! 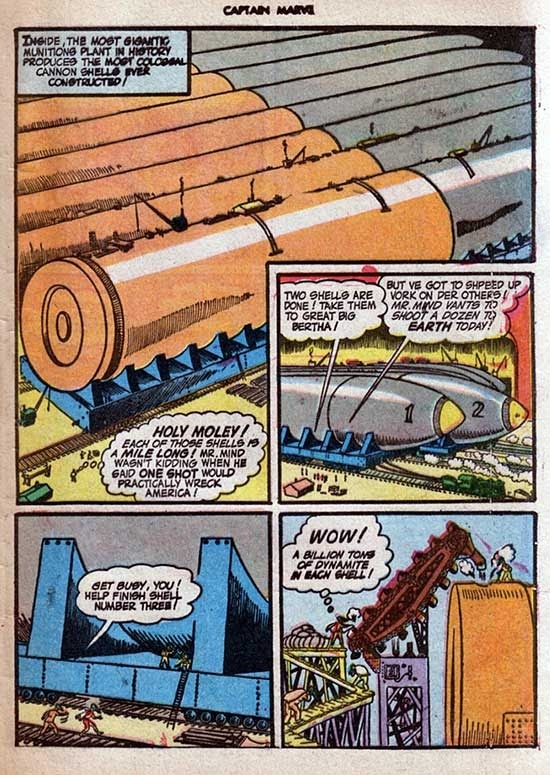 And it's described as a "misshapen airplane, but with that rotor above the fusilage, it's really an autogyro! 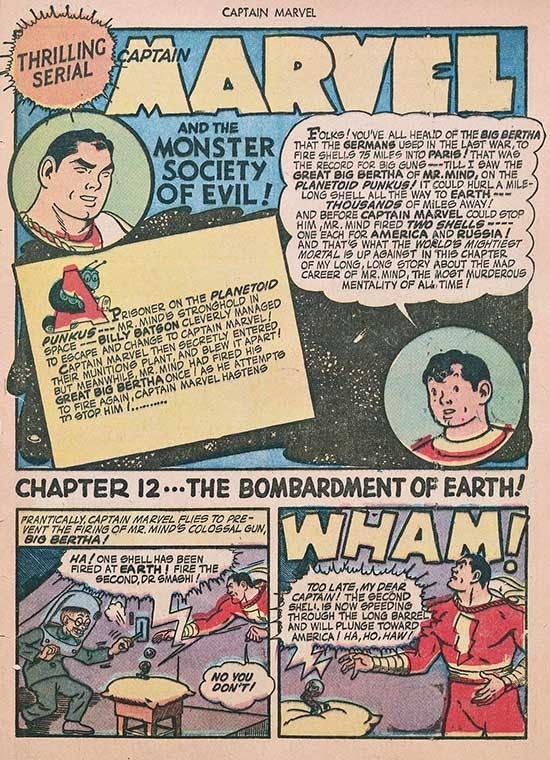 Note that, as of this story, the page count drops from 12 to 8. 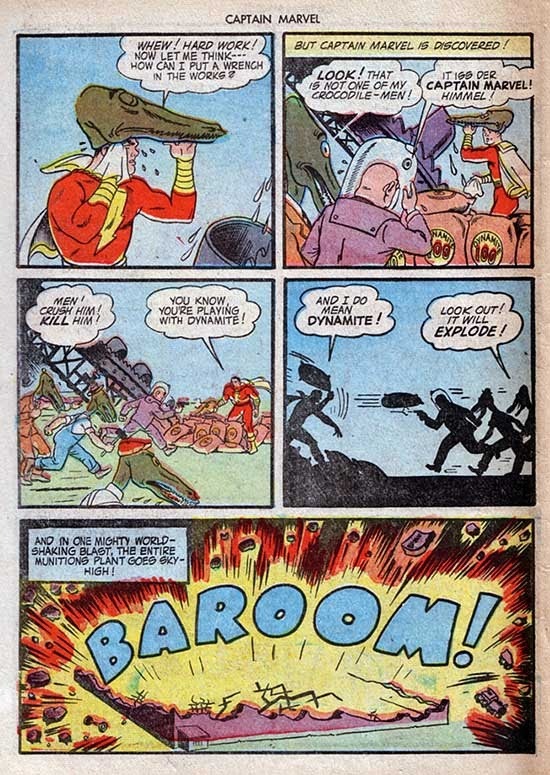 There's still lots of action, but now it's moving at a faster pace! 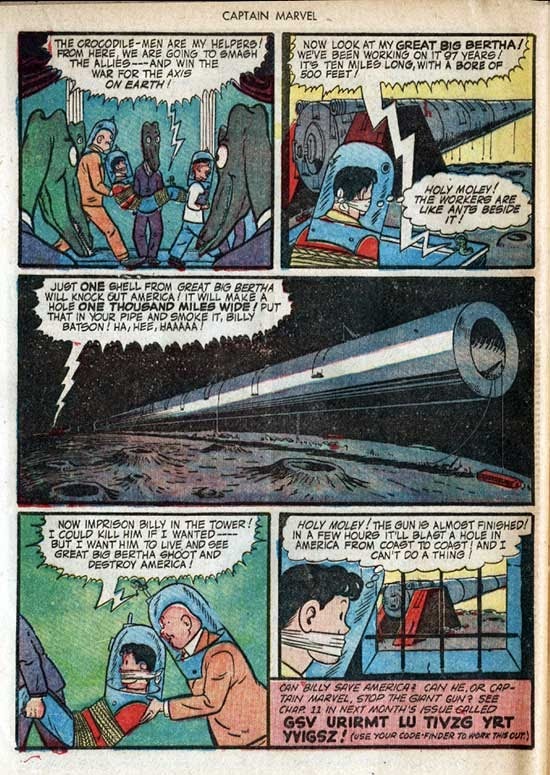 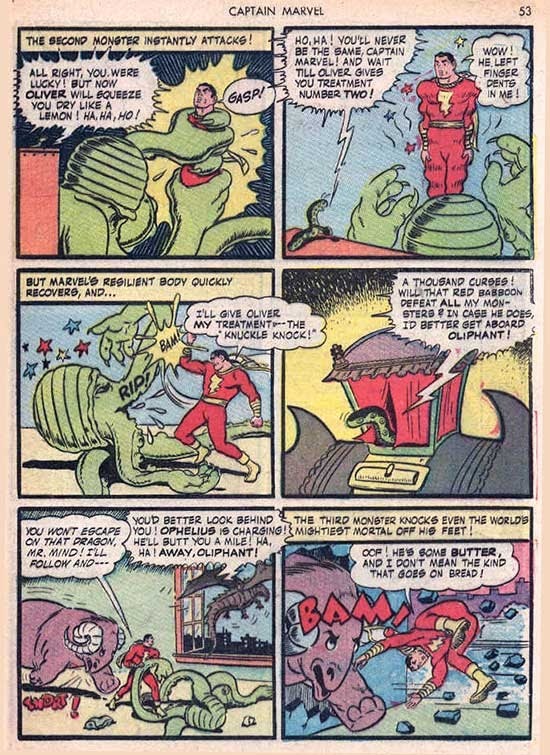 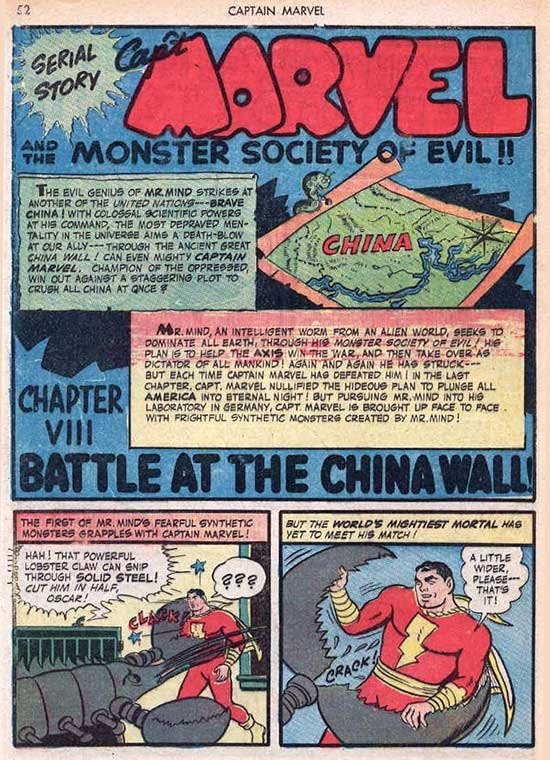 MONSTER SOCIETY OF EVIL "Chapter VIII: Battle at the China Wall!" 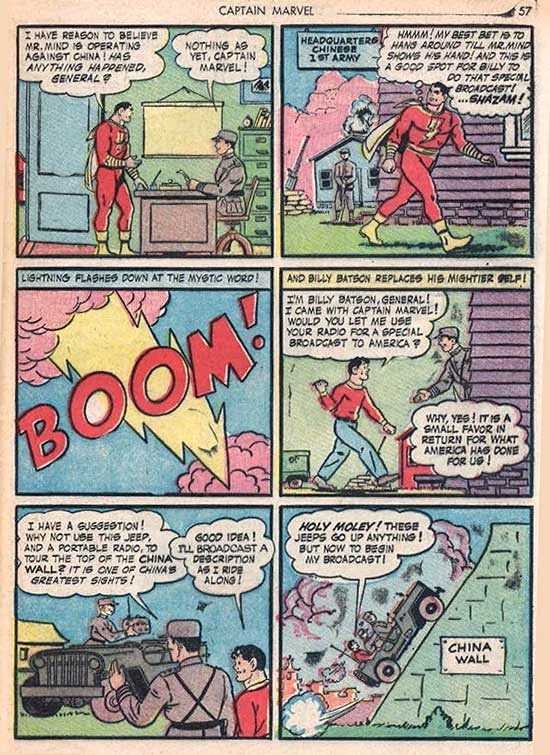 ...is Chinese...and a good guy! 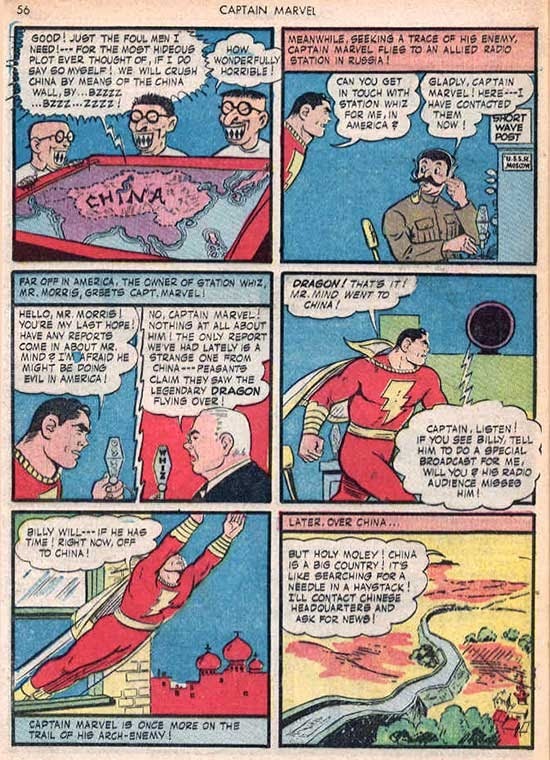 But inside, he (and the Japanese) are Caucasian-skin colored! 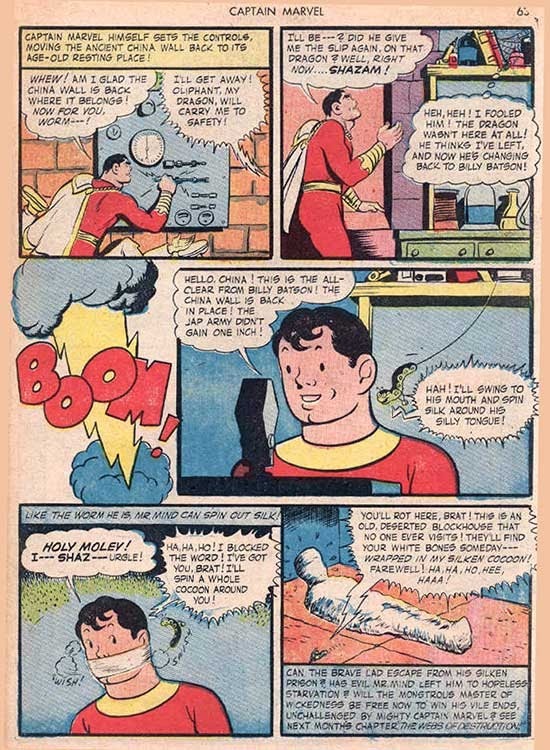 Aren't you lucky you don't have to wait a whole month to find out what happens? 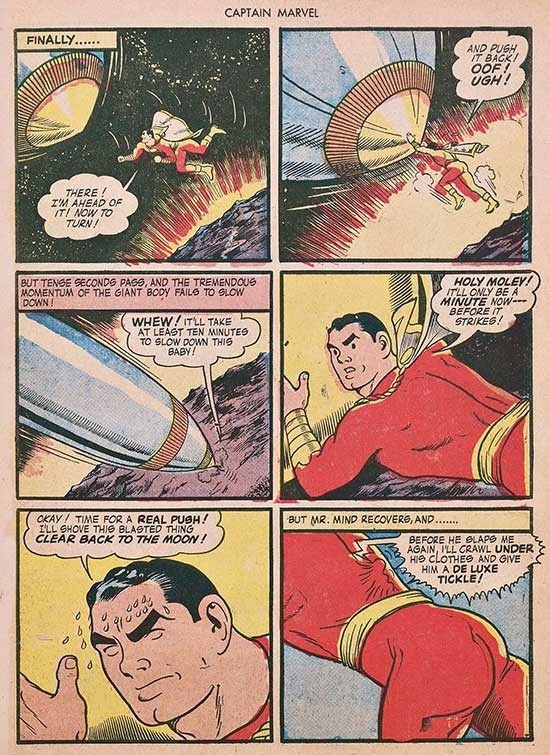 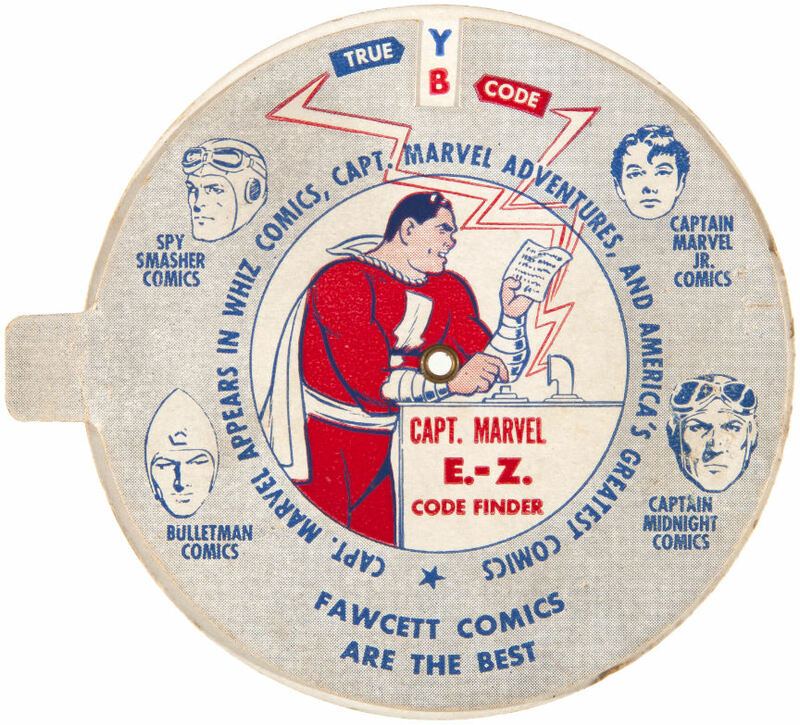 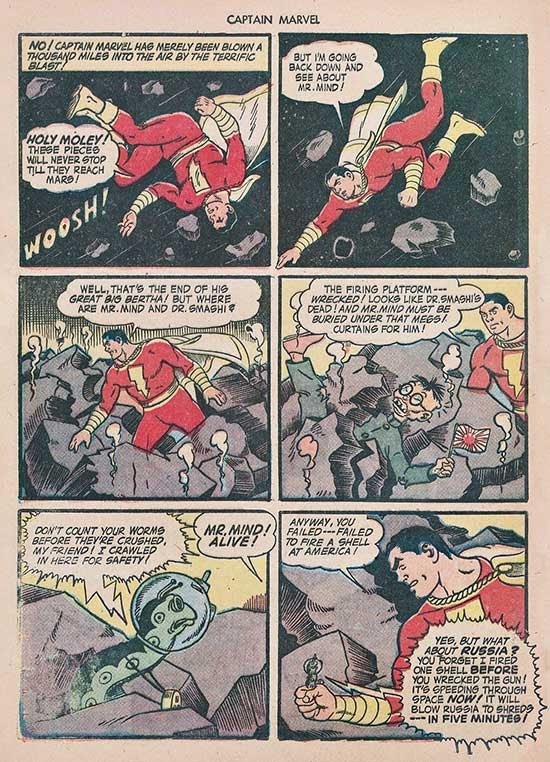 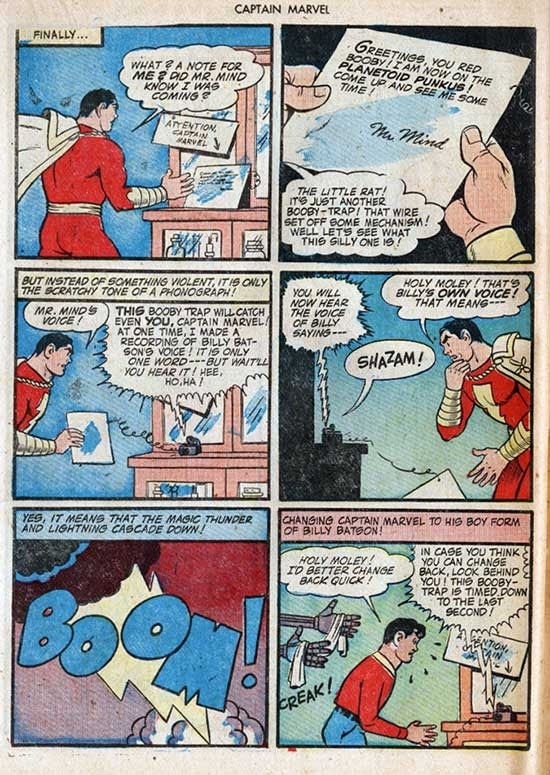 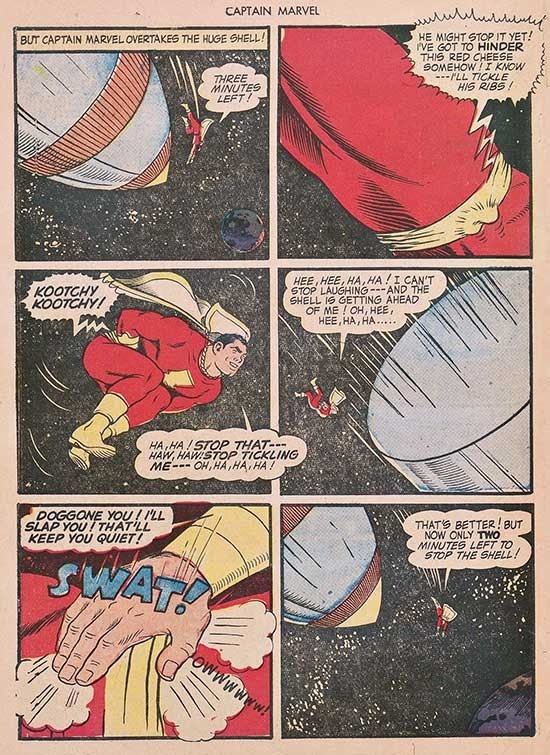 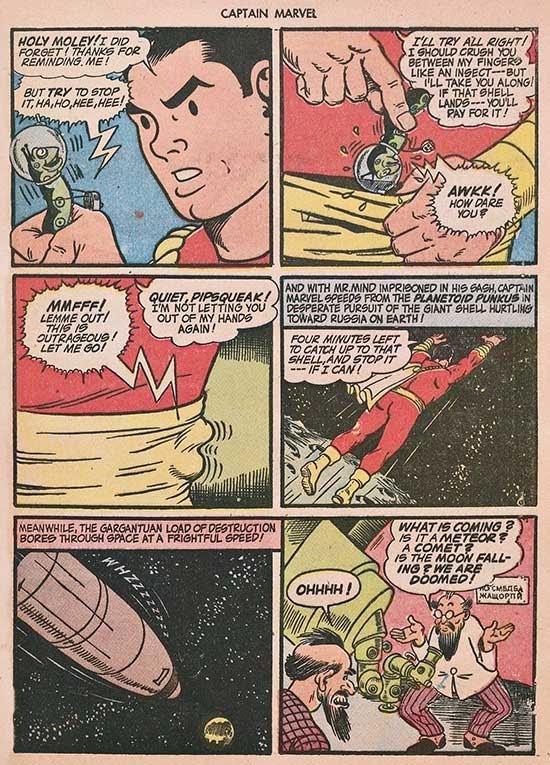 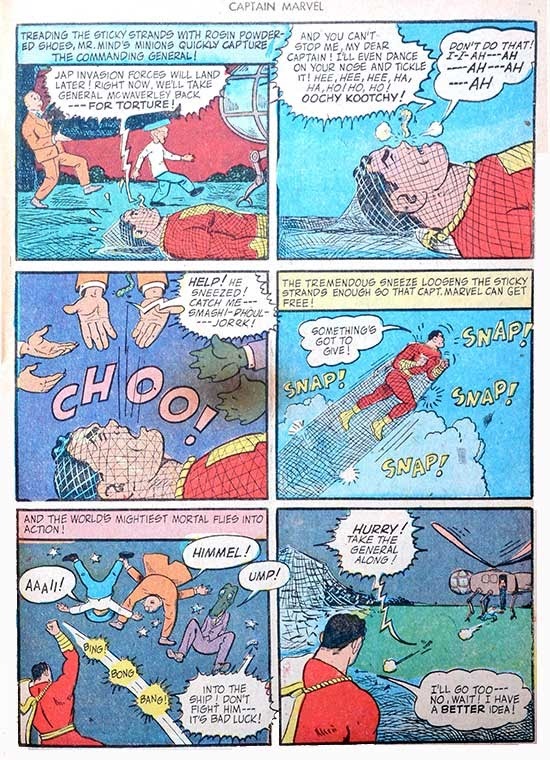 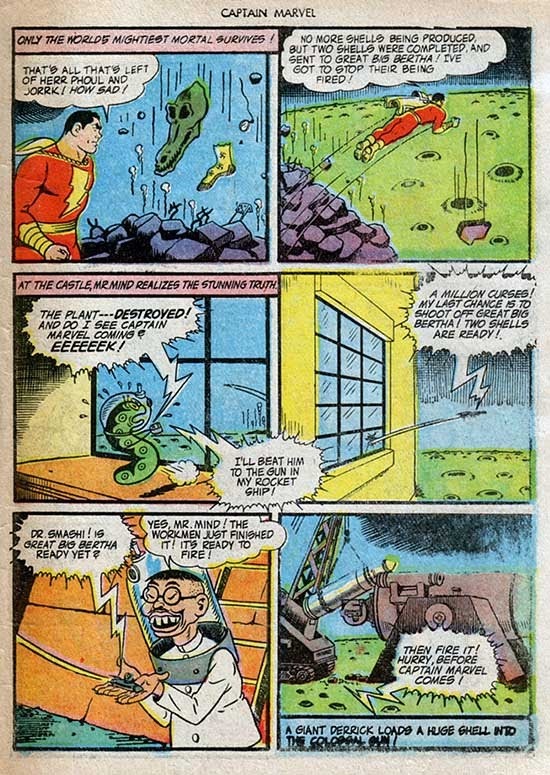 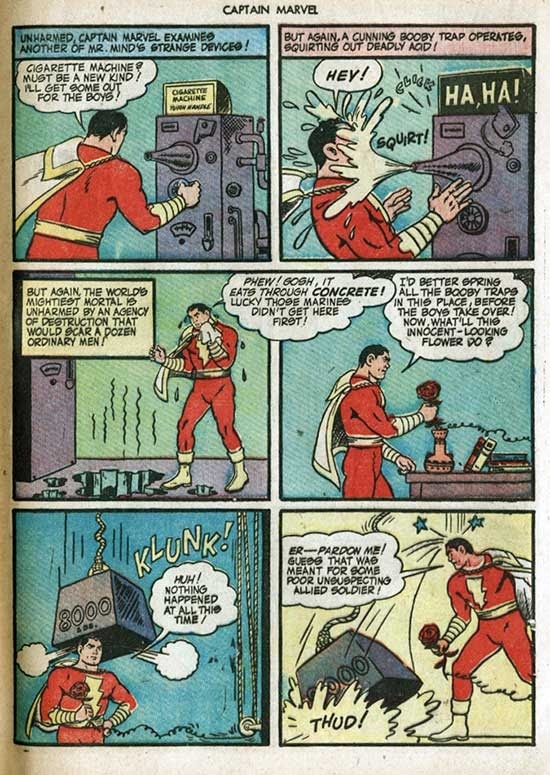 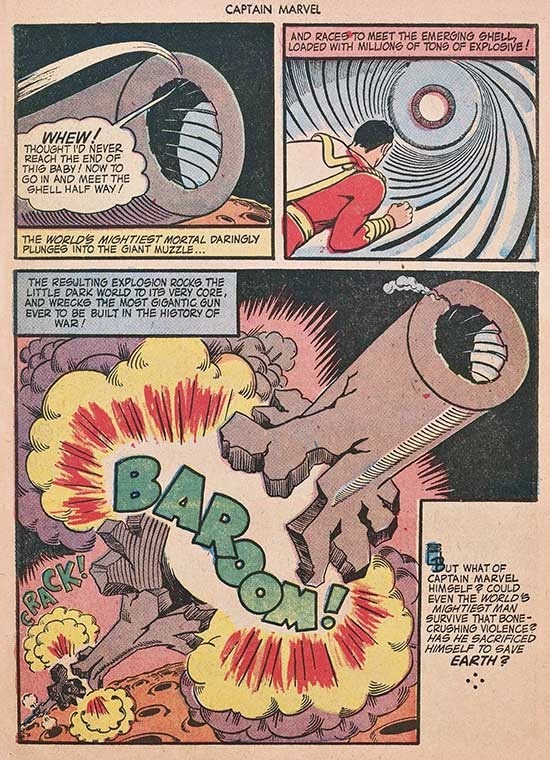 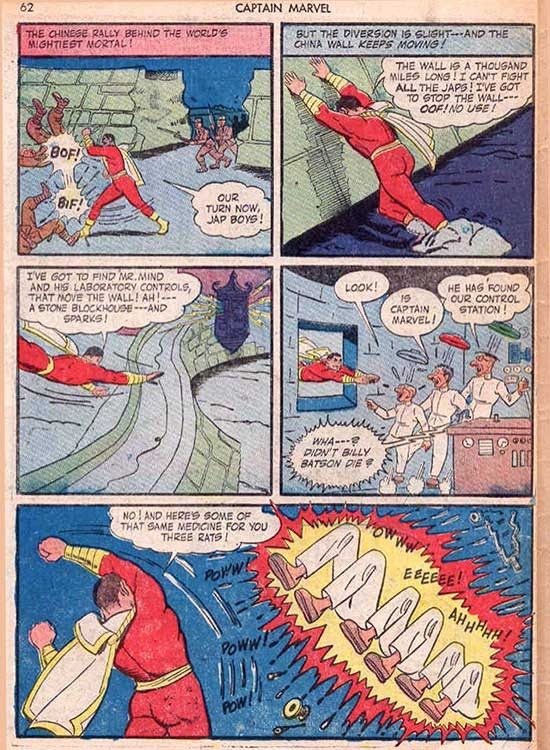 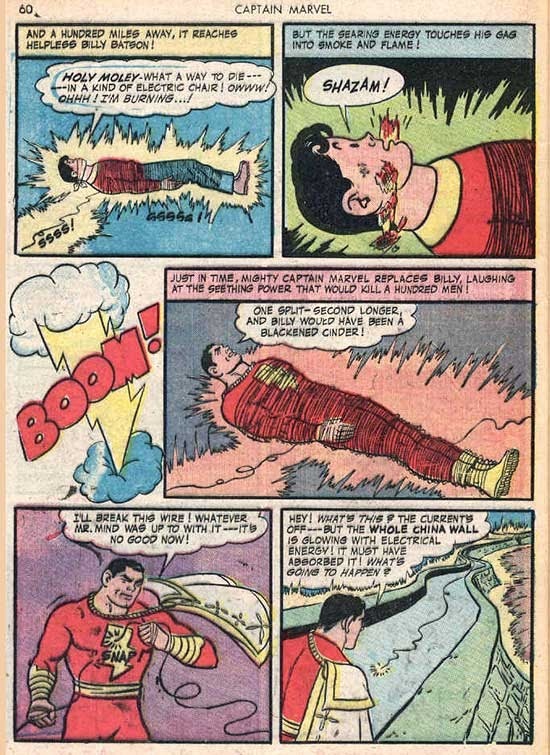 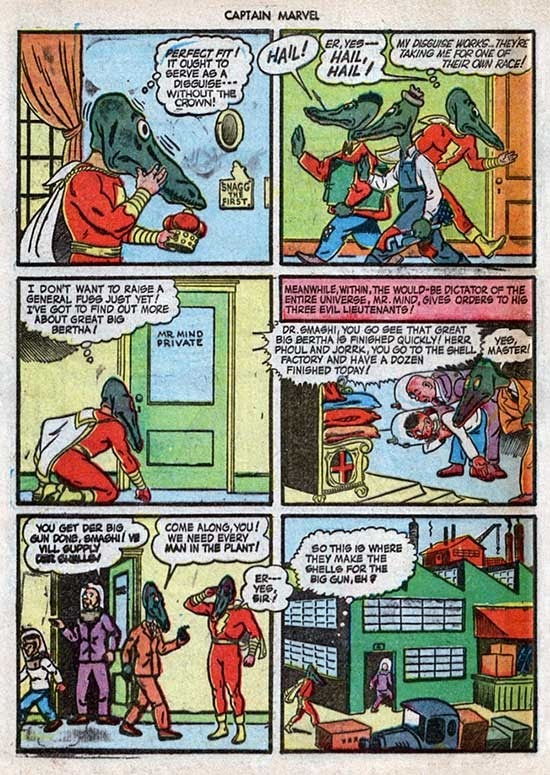 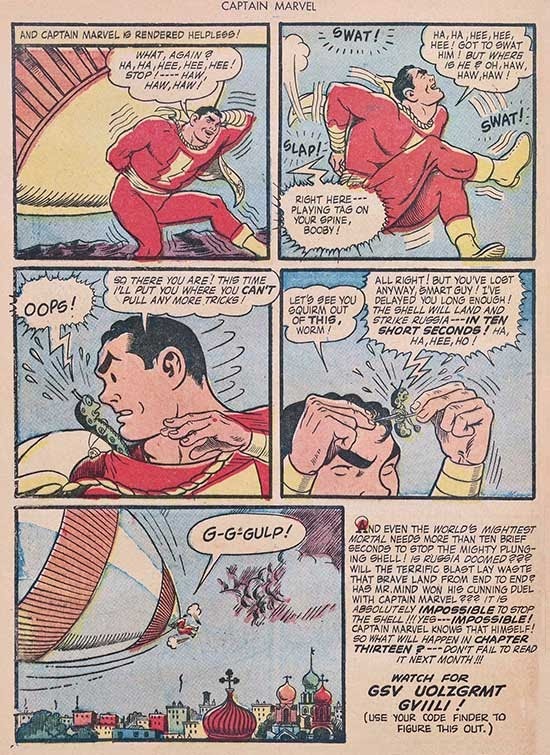 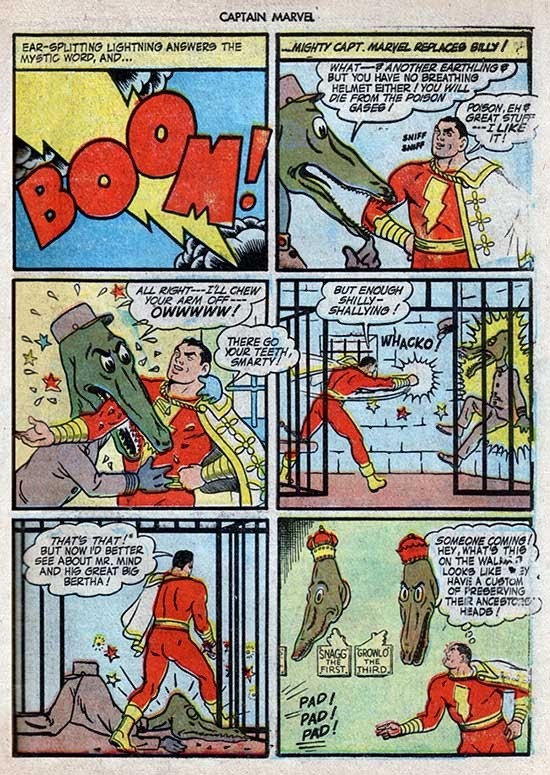 AFAIK, it's the only time Mr Mind has ever taken a personal...er...hand in attempting to kill Billy/Captain Marvel! 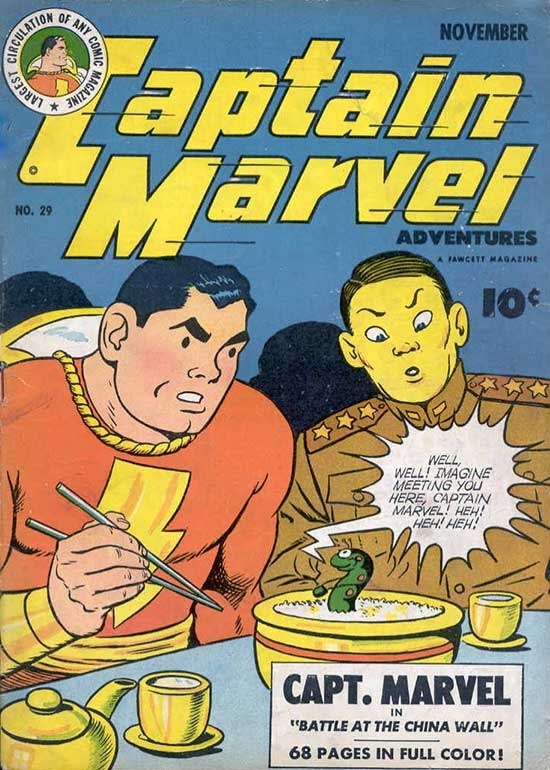 I wonder if the reason the editors made the Chinese officer on the cover bright yellow instead of 25% yellow 25% magenta "Caucasian" color everybody (incuding the sharp-toothed Japanese trio) is colored is because, without it, the officer didn't appear "Asian" enough to a 1940s casual newsstand browser?